In his prophetic book Blowback, Chalmers Johnson linked the CIA's clandestine activities abroad to disaster at home. In The Sorrows of Empire, he explored the ways in which the growth of American militarism and the garrisoning of the planet have jeopardized our stability. Now, in Nemesis, he shows how imperial overstretch is undermining the republic itself, both economically and politically. 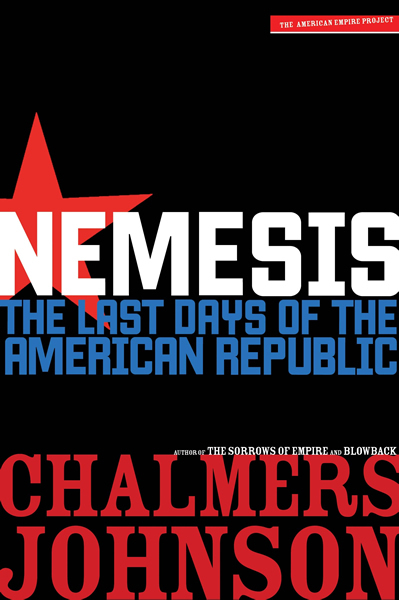 Delving into new areasâ€”from plans to militarize outer space to Constitution-breaking presidential activities at home and the devastating corruption of a toothless Congressâ€”Nemesis offers a striking description of the trap into which the dreams of America's leaders have taken us. Drawing comparisons to empires past, Johnson explores in vivid detail just what the unintended consequences of our dependence on a permanent war economy are likely to be. What does it mean when a nation's main intelligence organization becomes the president's secret army? Or when the globe's sole "hyperpower," no longer capable of paying for the vaulting ambitions of its leaders, becomes the greatest hyper-debtor of all times? In his stunning conclusion, Johnson suggests that financial bankruptcy could herald the breakdown of constitutional government in Americaâ€”a crisis that may ultimately prove to be the only path to a renewed nation.